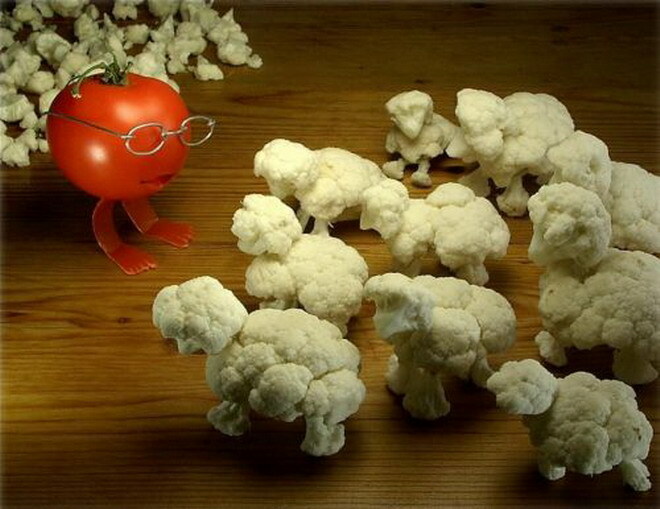 Thanks to my StumbleUpon options, I rolled across these creative photos of food yesterday that I thought I would share with you….People have way too much time on their hands, but I applaud the creativity. 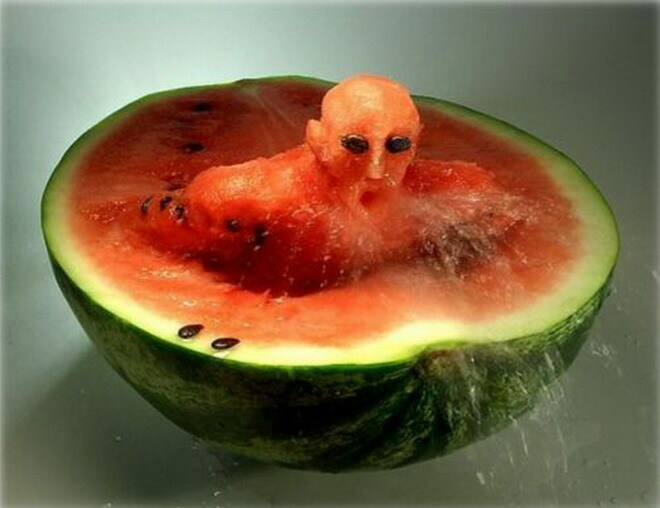 For more of these wacky food pics, Click Here. Taking advantage of the European bank holiday on June 2nd, my boyfriend and I will be enjoying a short getaway to the beach side Valencian city of Alicante. Though my experience may be slightly lost in a sea of mojitos and late-night clubbing, I hope to learn a little bit more about the specialties of southern Spanish cuisine. Not that I don’t love Italian food, but 8 months of overdosing on carbohydrates has got me yearning for something a little different. The area is famous for specialties such as Paella Valenciana and Gazpacho and the cuisine includes a lot of fresh vegetables, citrus fruits, and seafood. A traditional rice based dish including: short grain rice, chicken, rabbit, butter beans, great northern beans, runner beans, artichoke, tomatoes, fresh rosemary, saffron, paprika, salt, garlic, and olive oil. A cold, tomato based Spanish soup, using all raw vegetable ingredients. I will be gone from Saturday to Wednesday the 2nd… and hope to come back philosophically, alcoholically, and gastronomically enlightened. Details to come…. Coffin Baked Pizza: A Neapolitan Specialty? My friend Jeff just drew this article to my attention and I thought I would share it with all of you… You know, just to completely negate my previous article about how awesome the pizza in Naples was…. Maybe it tasted so good because they used coffin wood to bake it… Is this the secret ingredient??? Mozzarella di Bufala Campana, white stringy pillows of comestible bliss. This is not your ordinary tasteless zombie mozzarella, but rather a rich, flavorful cheese that can only be produced in designated areas of Italy’s Campania, Lazio, and Puglia regions. Produced from the milk of a domestic water buffalo, the flavor of Bufala mozzarella cheese is much richer and creamier than its cow milk (Fior di Latte) counterpart. What makes this mozzarella so particularly special however, is its characteristic texture. Heating milk curd in boiling water (temp of curd must reach at least 180F), it melts and is pulled into the stringy recognizable mozzarella consistency. 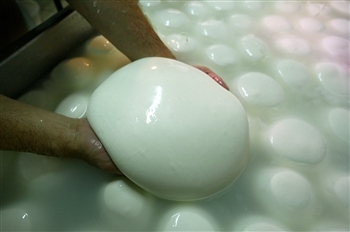 Formed into a large ball, the cheese is then hand pulled and thrown into a pool of cool water by the famous and well respected “Mozzarella Men”. 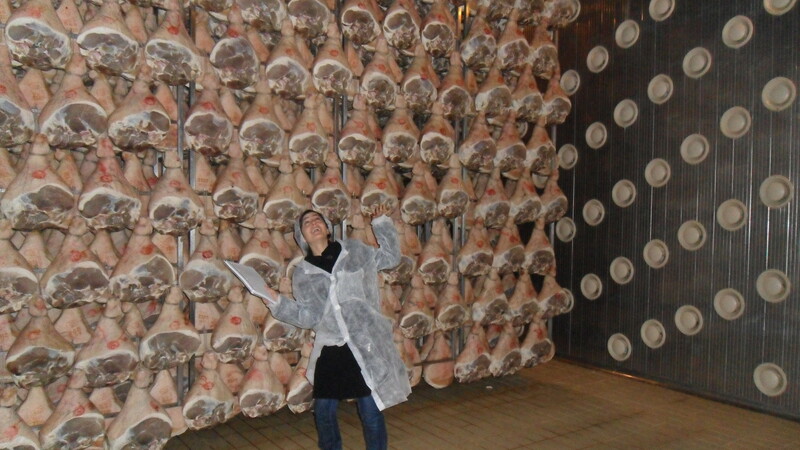 Describing the scene, it was something of an Italian Willy Wonka. After being formed into various sizes and shapes, the cheese is left to in a bath of salt water for a minimum of 4 hours to acquire its acidic, salty, and creamy taste. Mesmerized by the pulling and plucking of the cheese from its ‘mother ball’, I could barely wait to CONSUME. Never put mozzarella in the fridge, if its the fresh kind thats sold in a plastic bag full of water. In cold temperatures the cheese becomes dry and flavorless. It can last outside the fridge for 4-5 days at a room temp of 60-68F. When cutting into a piece of fresh mozzarella, finding water in the cheese mass is not an indication of high quality. Though this product has seen a lot of controversy in the past, with tainting and impure milk scandals, it remains nonetheless the pride of Campania. To be honest after a week of eating this stuff I can’t look at it for a while, but oversaturation of the product by no means it isn’t good. Mozzarella di Bufala Campana makes string cheese seem like a white stick of plasticized doom. Amongst the chaos of trash-littered streets, whizzing cars and vespas, and whistling men dressed in various shades of purple, in Naples, Pizza is king. Pizza: a fantastical almost hypnotizing dish with baffling simplicity. 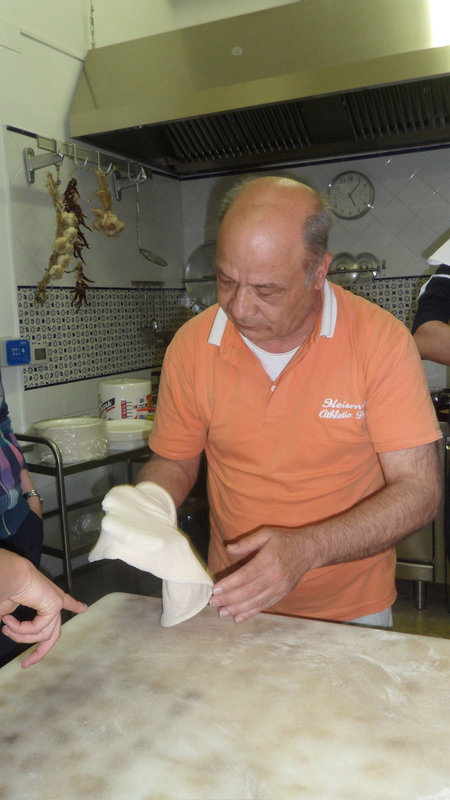 Flour, Water, and Yeast are the main components to this traditional recipe that helped to put Italy on the map as one the world’s most respected food capitals. Born in Naples, it is here that pizza is not only a filling dinner, but a testament to the very heart Neapolitan culture. 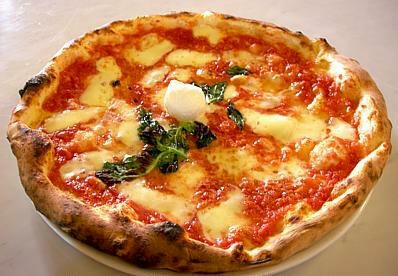 Unlike other pizza variations, the Pizza Napoletana can be recognized by its slightly raised crust and chewy texture. This pizza is a bit more doughy than the Roman variation, which is typically flat and crunchy. The most typical recipe is the Pizza Margherita, which is simply fresh tomato sauce, Buffalo Mozzarella, and fresh basil. 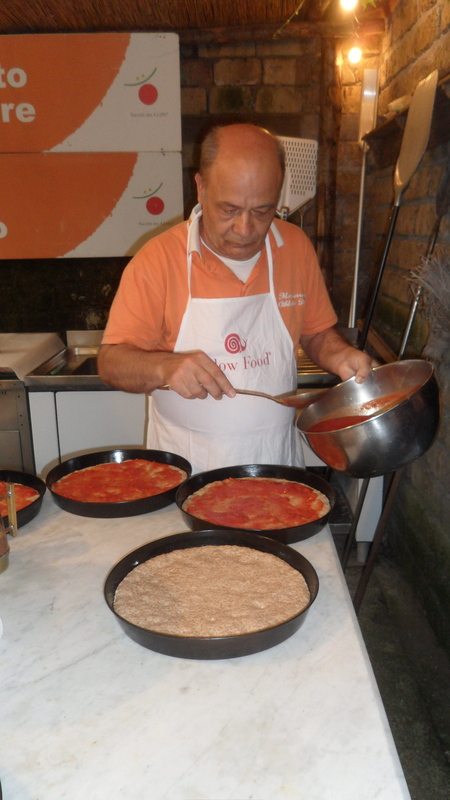 While top quality ingredients such as Caputo double 00 flour, and San Marzano tomatoes go into making a top quality pizza napoletana, Enzo explains that the most important ingredient is passion and concern for the product itself. Coming from a family of pizza makers, being a Pizzaiolo for Enzo isn’t simply to pay the bills, but rather, as an homage to his family and to his city’s culinary traditions. He also added that the right oven is key in creating the perfect texture and “cottura” (baking). At La Notizia, the oven was one of the restaurants most serious investments. 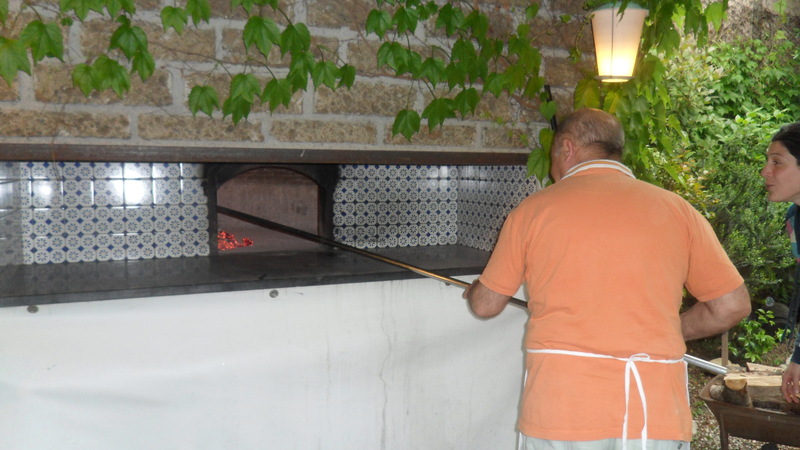 Costing almost 15,000 Euro ($18,000) the oven was constructed using bricks made with ash from Mt. Vesuvius, by hand. No electric $3,000 oven could replicate the pizzas that came flying out of Enzo’s oven of gold. Not to mention, this was one of the most awesome pizzas I’ve ever had in my life. The slightly chewy and soft texture of the dough, the sweet and tangy flavor of the tomato sauce, the spice of the fresh garlic. My mouth was exploding in sensory ecstasy. Ah, Naples… How I love thee. Foie Gras, a French word that rolls beautifully off the tongue but not so easily into the stomach, at least for some. Translated from French, Foie Gras literally means “fatty liver,” specifically speaking, the fatty liver of a duck or goose. Though the original notion of creating the delicacy was born in ancient Egypt, contemporarily, France produces the highest amount of this product per year (producing almost 19,000 tonnes and 78% of the worlds supply in 2005). Both within France and abroad, this delicate slice of buttery liver is not only a prized delicacy but also a controversial culinary concoction. 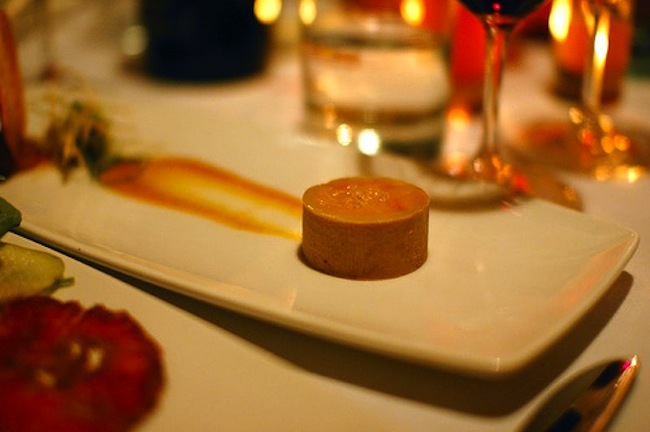 Topping the list of the world’s most disputed foods, Foie Gras has been continually denounced by animal rights activists who argue that its production methodologies are in violation of regulations that protect the humane treatment of animals. What is it about Foie Gras that separates it so distinctly from other forms of liver preparation and consumption? What makes this product so abhorred by animal lovers and squeamish eaters? The answer is simple: production, production, production. Foie Gras earned its namesake because of the effects of intentional force-feeding (in French this process is called gavage d’oie) on the livers of ducks and geese. Force-feeding techniques are the key contributors in rendering an incredibly oversized and highly fatty liver, ultimately creating the rich, creamy and delicate texture of the consumable product. 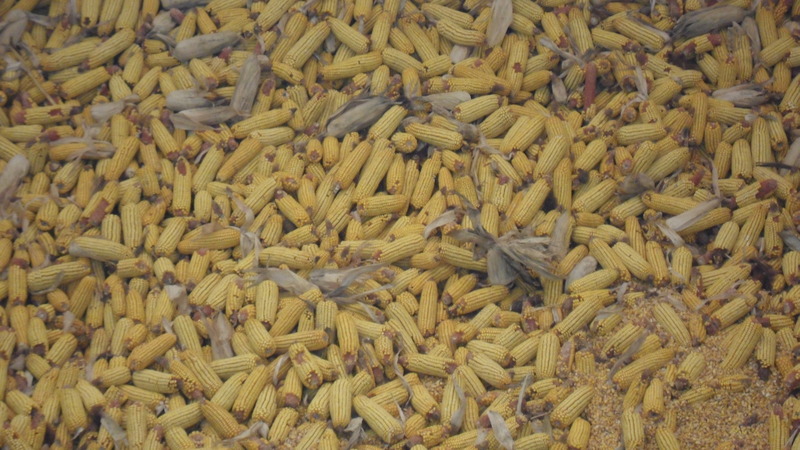 Using specially designed machinery, a long feeding tube is inserted into the throat of farm-raised ducks and geese twice a day to fill them to capacity with a strict diet of corn. While producers claim that this force-feeding process is painless to the animals because they lack an esophagus and gag-reflexes the practice is nonetheless concerning, especially regarding the harmful effects of an oversized liver to the animal. Based on my prejudgements, it was difficult to enter the heart of a land that held foie gras to a different luxurious standard, and went against activists’ requests to cease its production. The duck farmer and producers at J.Barthouil were wary of the issues their product has caused, and are working hard to change its internationally notorious reputation. In foie gras’ defense, we were told that ducks and geese are migrating animals, and therefore are naturally equipped to store fat for long periods of migration. Therefore, their livers are easily enlarged by the gavage force-feeding process. As far as the animal’s health was concerned, the producer at J.Barthouil assured us that, “If we were to let these animals free, thus stopping the gavage feeding techniques, their livers would return to normal in a matter of days.” This statement seemed hard to believe but was nonetheless accepted by the majority of those who listened. On the company’s brochure, it is advertised that foie gras is “in fact the healthy liver of an adult duck or goose,” however, seeing the large, fatty, beige mass that they defined as liver, the optimal health of the organ was marginally apparent. Emphasizing the fact that animals are not stressed during this force feeding process, the producer underlined the fact that a stressed animal would produce a low-quality tasting product. Not surprisingly, the producers at J.Barthouil lamented that while their product is made without the use of chemical additives and organic feeding, the foie gras itself cannot be registered as an organic product. Regardless of details in feed and the free-range living conditions of animals used for this particular company, it cannot receive an organic certification because of complaints made by animal rights activists. It must be said however that the duck farm we visited in Domezain-Berraute was a small-scale production facility which allowed for ducks to roam freely in a large area of land b efore their ultimate fate in the gavage room. 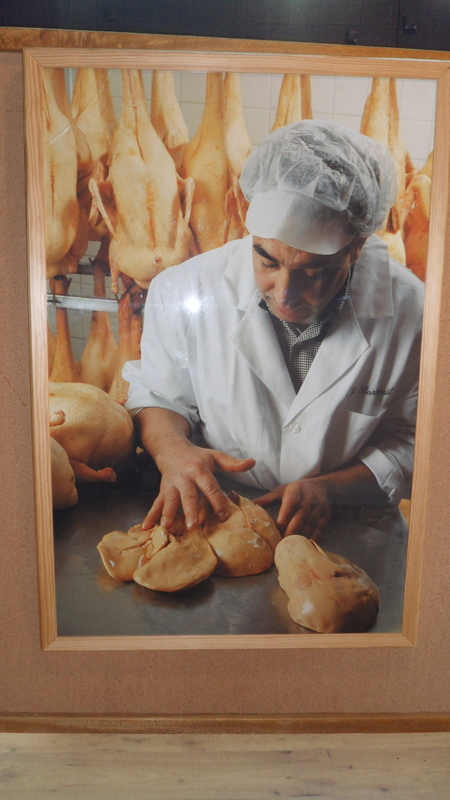 Unlike industrial manufacturing of foie gras, one could definitely acknowledge a different quality of care and respect that this farm had for its animals. The final consumable product however, was nonetheless created using the same basic methods of force-feeding. Entering the gavage room on the duck farm in Domezain-Berraute, the pungent and absolutely nauseating smell of the caged animals overwhelmed my senses. As my eyes began to water, the kind farmer boasted that the quality of his foie gras cannot be met by industrial manufacturers. While this statement was confirmed by my classmates, who happily enjoyed the fruits of the farmer’s labor, I could not help but ignore the underlying truth and reality that goes into making foie gras. The facility was vast, and divided into small cages each housing seven ducks. The room was equipped with large industrial fans that the farmer told us were necessary to cool the animals who were overheated due to their extensively large diet. Looking up close at the animals, I was almost frightened by their size. Never had I seen a duck that large in my entire life. Their backsides almost sagged from their bloated internal organs. I continued to hold my breath. 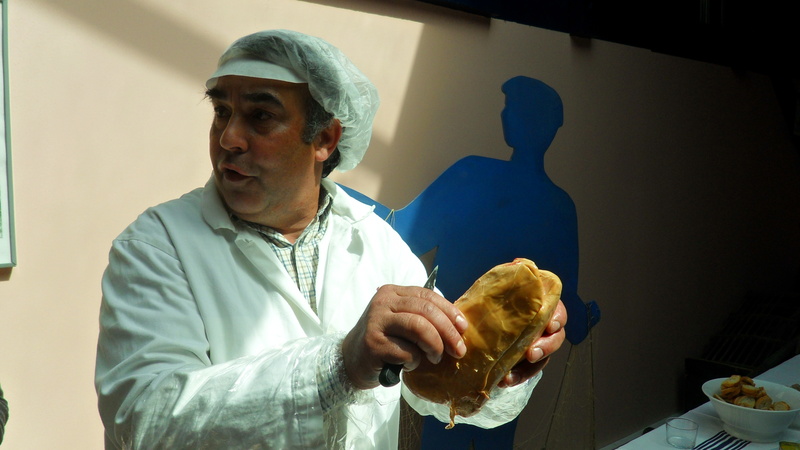 Leaving the gavage room and liberated into the fresh air of the outdoors, we learned about the traditional conservation methods of foie gras. While it can be whipped into a mousse, packed into a confit, or preserved whole, the most important conservative is duck fat. It can be packaged into cans which extends the conservation of this product to well over a year or jars filled with the duck fat that can be kept for many months. The final question of consumption remains that the disposal of the consumer, based on his personal preferences, beliefs and priorities. 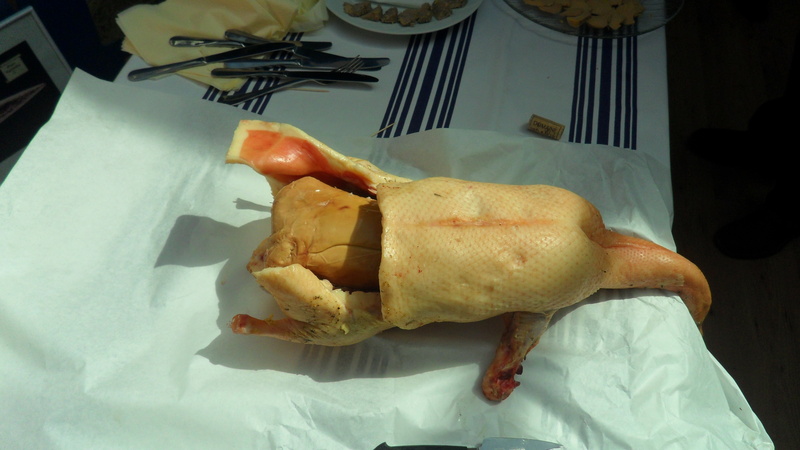 For some, specific issues of animal rights are not considered when eating luxury products such as foie gras, after all humans are carnivorous beings. The concept of consuming a fine delicacy holds high importance for food lovers, especially professional gastronomes therefore making the controversial debate surrounding foie gras seem superfluous. Others however, dance to a different beat, allowing themselves to enjoy eating meat products while still remaining wary of the places from which these products come. Being that foie gras is a major staple of French cuisine, it would be useless to make a successful campaign to abolish its production altogether, but a knowledge about the facts that go into making a product of this kind is important to understand the origins and sacrifices that go into the foods we eat and the choices we make as informed consumers. My liver hurts….and something tells me it’s not the fault of my lush-inclined habits.